Is preservation-based downtown revitalization worth it? Does the investment of dollars and time to historic downtown improvement provide a significant return? These questions were at the forefront 30 years ago, when the national Main Street concept and Texas Main Street Program (TMSP) were officially launched. Although there were no definitive answers to the viability of this grand leap of faith, in retrospect, it has proven to be successful. In fact, as the years have passed, thousands of Main Street communities across the country have realized tremendous accomplishments, including many in Texas. Whether through the Main Street process or independent preservation-based downtown revitalization activities, all successful efforts have included a community-wide belief in the value of historic preservation; government willing to spur and support preservation activities; and proper stewardship of properties by owners. Much of the revitalization effort is visual—from special events that bring people downtown, to quirky cutting-edge businesses that draw shoppers into historic buildings, to building rehabilitations that turn an eyesore into a source of community pride. Colley adds that people are often surprised to learn that significant building improvements are not always expensive. While the TMSP design staff works on many high-dollar projects, they also work on improvements that cost a few hundred to a few thousand dollars. For example, Eagle Pass’ Main Street program recently upgraded several buildings in its historic business district. A recertified Main Street community since 2010, much of Eagle Pass’ success can be traced to significant support by the municipal government to spur downtown revitalization. According to Eagle Pass Main Street Manager Joe Cruz, the city and community focused their efforts on a façade restoration program. Eagle Pass resident Angelica Hesles, owner of Hesles Downtown, was proud to be the first participant in Main Street’s façade restoration program. Her company started as a dry goods store, and has developed into a combination of outdoor gear, dry goods, and a newly added ice cream and yogurt parlor. She said the restoration of her store has drawn positive attention from locals, surrounding communities, and media. A different yet equally effective Main Street project was recently completed in Seguin, where existing business Gift and Gourmet moved downtown and undertook a significant rehabilitation, including the removal of a large slipcover, which revealed second-floor and transom windows. She adds that it ultimately drew new customers, and the grand opening was a far greater success than she ever expected. Another example of a successful Main Street project recently occurred in Decatur, although it wasn’t clear from the outset if the building’s color would become a controversial issue. The TMSP does not dictate a specific color palette; however, it recommends individuality for buildings and supports shades of color that are compatible with the rest of the historic downtown. Bright colors can be used, but TMSP staff suggests using them for accent colors rather than the entire façade. In Decatur, this philosophy was put to the test when Fuzzy’s Taco Shop moved into a historic Main Street building. The original bright paint scheme was a bit overwhelming for the downtown, so the local Main Street manager, business representatives, and TMSP staff worked together to find a solution—utilizing softer colors and complementary tones—that worked for everyone. To learn more about the TMSP’s services and application process, please visit our website or call TMSP State Coordinator Debra Drescher at 512.463.5758. This article was originally published in the Spring 2014 issue of The Medallion. 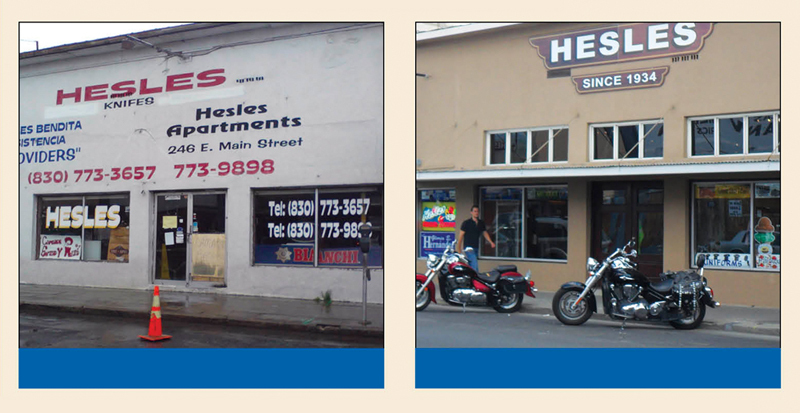 Hesles in Eagle Pass is pictured above (left) and after (right) participating in the Main Street program's facade restoration initiative.